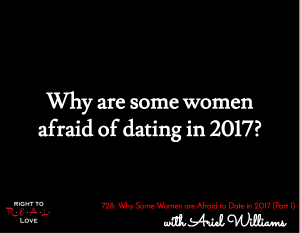 In this episode, Jay is joined by Ariel Williams to address the question: Why are some women afraid of dating in 2017? Why are some women afraid of dating in 2017? The fears some women have about dating in 2017. Common fears that women have about dating in 2017. The importance of examining ourselves to see why we attract certain types of people. Why it is important to know why we have a fear of dating. How bad past experiences can impact our perspective towards dating.